Money laundering schemes are constantly evolving, which requires public authorities to constantly up-date their knowledge and implement state-of-the-art measures to combat corruption. The monograph demonstrates how the Ukraine can improve its implementation of FATF recommendations to fight money laundering and corruption and how it can better organize the mechanisms of state regulation and the monitoring of financial activities. This monograph offers a new approach to implementing an anti-corruption strategy in Ukraine and suggests how the fight against corruption within government can be streamlined using modern methods and a risk-based approach. 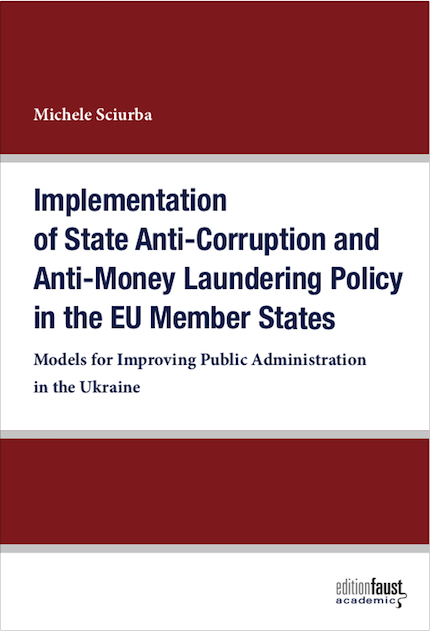 Drawing on the experience of EU countries through a comparative analysis of the rules and procedures for structuring public administration policy, this work proposes developing recommendations to strengthen the Ukrainian anti-money laundering and corruption policy. Corruption remains a widespread problem at various levels within Ukrainian public administration and it has significantly weakened public confidence in government and in the judicial system. In an international comparison of corruption in 180 countries, Ukraine ranks 130th, making it one of the most corrupt countries in the world. At the same time, Ukraine has an AML/CTF legal administrative framework in place that largely meets the current formal requirements of the FATF. The Ukraine has implemented AML and anti-corruption measures under the Council of Europe’s Moneyval monitoring mechanism. In addition, Moneyval has been an associate member of the FATF since 2006. The National Bank of Ukraine (NBU) practices risk-based banking supervision and has made significant progress in creating transparency regarding the beneficial ownership of banks. In recent years, Ukraine has consistently removed criminal owners from the banking sector and established an efficient sanction regime in response to breaches of legal obligations, including the withdrawal of banking licenses. Furthermore, the establishment of a unified state register for beneficial ownership allows authorities to identify banking clients. In terms of mutual legal assistance on money laundering and corruption, the Ukraine has also made significant progress. Ultimately, the Ukrainian AML/CTF framework has been refined significantly in recent years. Today, there is a clear understanding of money laundering and terrorist financing risks in Ukraine both at the administrative level and at the level of the supervisory authorities. As a result, far-reaching legislation has been established. Nevertheless, this development cannot hide the fact that money laundering via shell companies is still part of everyday life in Ukraine. The Ukrainian criminal justice system continues to be heavily influenced by corruption and has failed to effectively combat it. Ukrainian cross-border prosecution of money laundering offences, in particular the confiscation of proceeds of crime in other countries, is ineffective due to a lack of experience and the absence of legislation spelling out direct areas of responsibility and formal procedures. Finally, a central problem is the lack of confiscation orders which impedes the efficient prosecution of corruption and money laundering.